Hosted CI is a hosted continuous integration service (developed by me) which is specifically tailored for iOS and Mac developers. CocoaPods support. I love this feature! As you may have noticed – Hosted CI now has own blog where I post feature updates and some useful tips for developers. Note that we also have updated our pricing plans. There is a new Indie plan which is only $19/month + Max plan now costs only $199/month. I’ve recently stumbled upon Mike Abdullah’s blog post which has raised an interesting issue. When ARC is used, weak properties can be set to nil by the runtime. However if you register for KVO notifications using addObserver method, you won’t get notified of it. This is interesting, as it basically breaks KVO compliance. It is also worth noting that other updates of such properties still result in notifications. Basically it is a category on NSObject that replaces addObserver method with own implementation using method swizzling. It checks whether observed key corresponds to weak property and logs a warning in such case, then just calls original implementation. For convenience grab complete code as Gist. Check out our new service for iOS developers – hosted continuous integration. When using UITableView in iOS apps quite often you’d like to customize its design. In particular it is typical to change background color of cells and color of separators. It is usually trivial enough with plain style table views, however may get tricky when you have grouped style table view. The problem is that if you change backgroundColor property of a cell in a grouped table view you don’t get expected result. 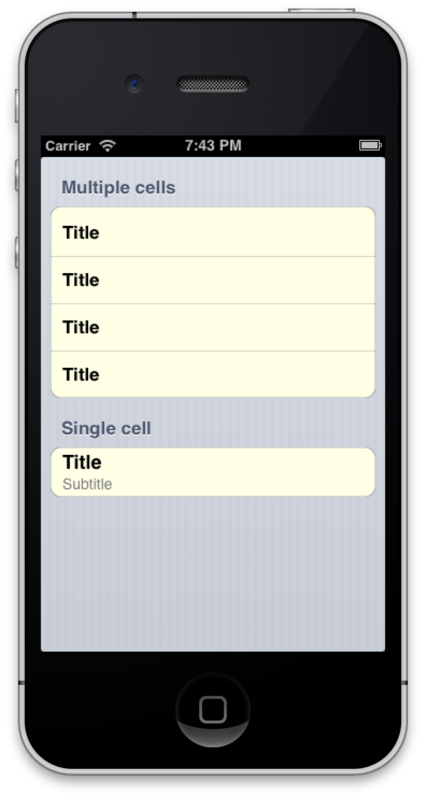 So the solution is to change backgroundView of a cell instead. Quite common technique is to use images and so UIImageView for the purpose. However if you want to keep standard look of cells but just change background color and border color it isn’t convenient. Note that by using [UIColor colorWithPatternImage:] you can use not only solid colors but textures or gradients as cell background. Full code is available as Gist, feel free to fork it.